note : could have been born in Belmont County, near Irondale, Jefferson County, or Kirksville, Shelby County, Ohio. In the Court of Common Pleas of __ County. 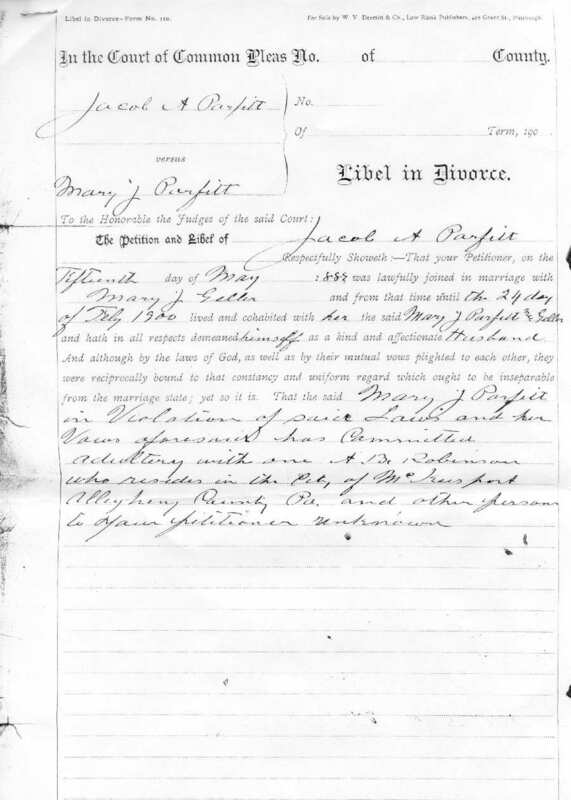 Jacob Parfitt versus Mary J. Parfitt } Libel in Divorce. 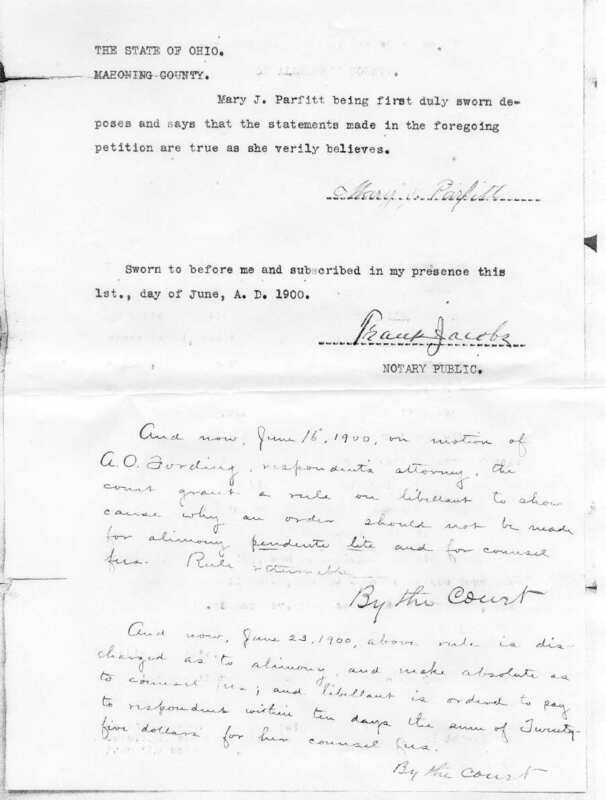 To the Honorable the Judges of the Said Court : The Petition and Libel of Jacob A. Parfitt respectfully showeth : - That your petitioner, on the fifteenth day of May, 1889 was lawfully joined in marriage with Mary J. Geller and from that time until the 24th day of Feby 1900 lived and cohabitated with her the said Mary J. Parfitt nee Geller and hath in all respects demeaned himself as a kind and affectionate Husband. And although by the laws of God, as well as by their mutual vows plighted to each other, they were reciprocally bound to that constancy and uniform regard which ought to be inseparable from the marriage state; yet so it is. That the said Mary J. Parfitt in Violation of said Laws and her Vows aforesaid has committed adultery with one A. B. Robinson who resides in the City of McKeesport, Allegheny County, Pa. And other persons to your petitioner unknown. And also, That a decree of this court may be given for a separation from the Bonds of Matrimony aforesaid as of the same had never been contracted. And he will ever pray, &c. (signed) Jacob A. Parfitt. In the Court of Common Pleas No 3 of Allegheny County. 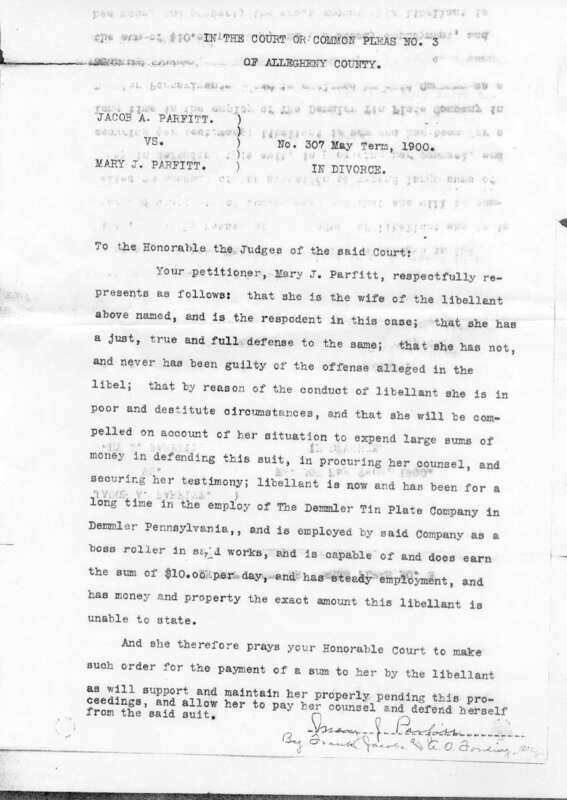 Jacob Parfitt vs. Mary J. Parfitt } No. 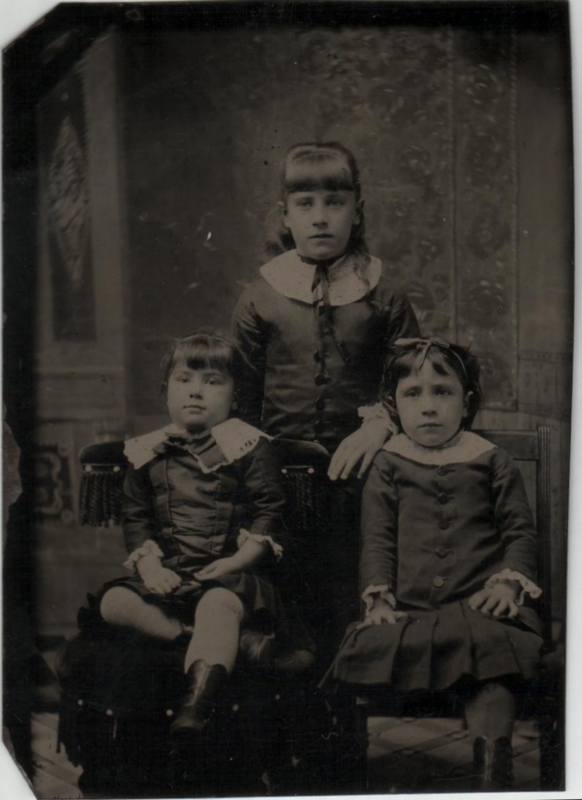 307 May Term, 1900. IN DIVORCE. Died : Found dead, ‘…in a gutter…’, likely from too much drink. 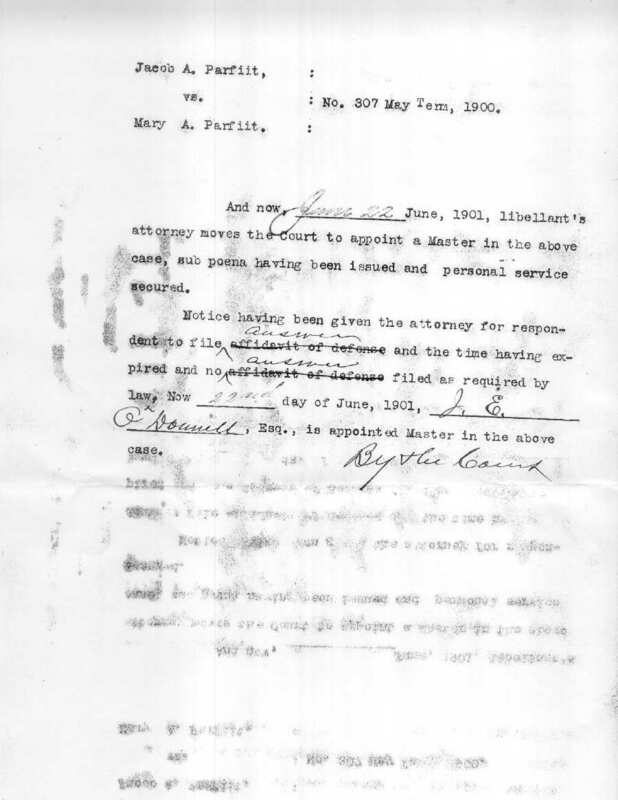 Date of Birth : May 1895? Note : Veteran of the Great War 1917-1918, 80th Division. 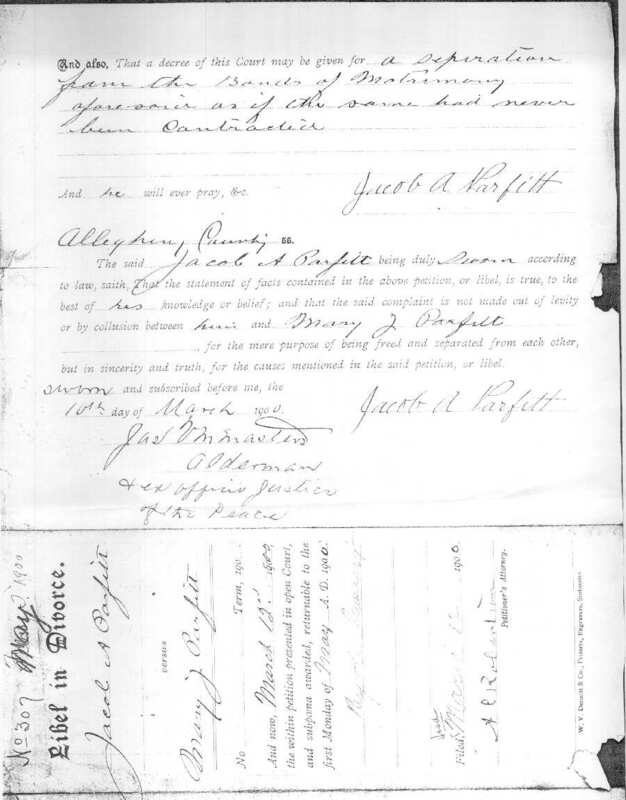 1900 Federal Census for McKeesport, Allegheny County, Pennsylvania. Enum Dist 430, sheet 19. T623 Roll1363. National Archives and Records Administration. Washington, DC.